This additional quarter is helping pay for 16 new washers and dryers at the 2 Boylston Place residence hall and 9 washers and 10 dryers at Piano Row, Dickson said. The Colonial Building and the Paramount Center each have 10 new dryers, she said. 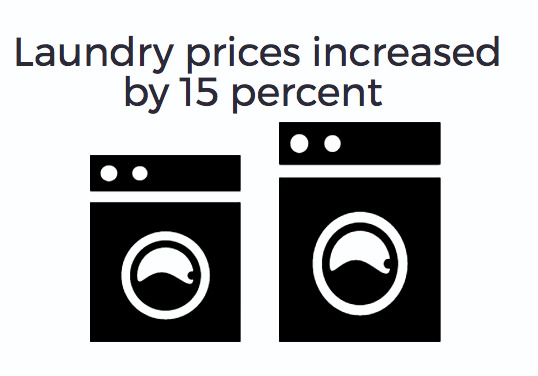 The increase per cycle is the first laundry price increase in over three years, Dickinson said. This price is guaranteed until the contract is up for renewal again in seven years, Dickinson said. The increase affects all of the college’s residence halls except 12 Hemenway, where students receive free laundry. The college updated the price of laundry on its website but students were never directly notified. Sam Lane, sophomore performing arts major, said she thinks lack of communication is irresponsible on the college’s part. Freshman communication studies major Emily Wangsaid she thinks an email announcing the change would have been helpful for new students. “[New students] are very unfamiliar with our environment as we move on to campus so the more details, the better,” Wang said. Wang said she thinks $3.50 is expensive for a load compared to other colleges she visited. Massachusetts Institute of Technology charges $2 per load and Massachusetts College of Art and Design charges $3, according to the college’s websites.